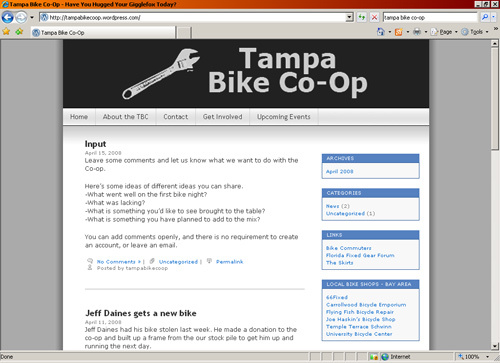 Three new bicycling advocacy resources “went live” in the past couple months here in Florida…two in the Tampa Bay area and one in Florida’s largest city, Jacksonville. Check them out! 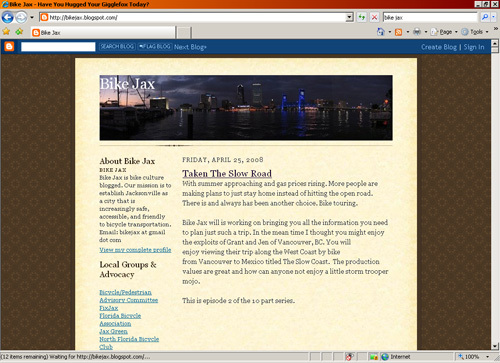 Bike Jax is described as “… bike culture blogged. Our mission is to establish Jacksonville as a city that is increasingly safe, accessible, and friendly to bicycle transportation. ” The folks running the show over at Bike Jax are really friendly, too — it’s worth a visit, especially if you’re in the northern part of Florida and want to check in on bike-friendly events and news. When this many bike shops can pool their resources to make bicycle advocacy a big priority, this lends a LOT of muscle to the movement here in Tampa Bay. 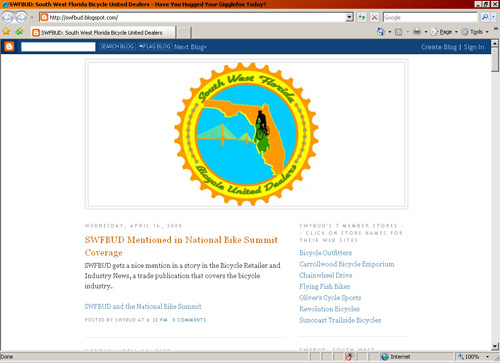 SWFBUD is also responsible for putting on the annual Bicycle Bash by the Bay. “Diamond” Dave Japenga is one of the masterminds behind the co-op and is the hardest-working man in showbiz (he’s also Tampa’s only professional bike messenger…more on that later). Come check out these great resources. With folks like these keeping area cyclists up to date on important issues of advocacy, we’re all in a better place! Peter…I doubt we’ll hear any more about this story — that’s the way it works around here: no charges filed. Bicyclists are second-class citizens in the Tampa Bay area, even when they were obeying all applicable laws. According to the story, the sky was dark and the motorist had the right-of-way. I wonder what REALLY transpired (whether the bicyclist was well-lit, sober, etc. ), but we may never know. Hey Ghost Rider. It’s my turn turn to say thanks for the linky love. Also for the kind words. Our readership has skyrocketed since. Thanks again and I look forward to meeting you down road. really?!? You know how to say the most flattering things!! !